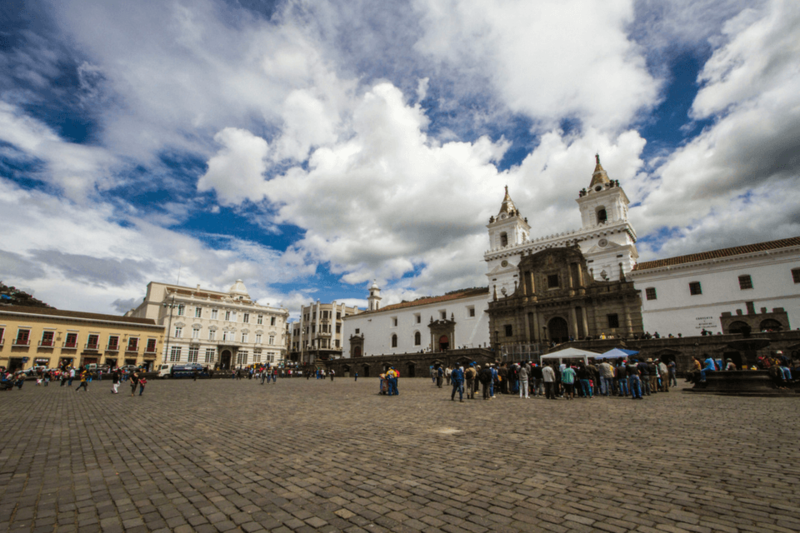 The best way to discover Quito is by walking around. As you explore on foot, you’ll get to absorb the city’s atmosphere, history, traditions and people. Picturesque squares, baroque churches and snow-covered peaks form the backdrop to this vibrant city. You’ll see indigenous people wearing delicately embroidered shirts and traditional hats cross paths with tourists amid the shouts of street vendors and shoe-shiners. All of this as whiffs of delicious Andean cuisine and its aromas spill out through the windows of restaurants that line the streets of Quito’s Old Town. Due to its excellent location in the historic center, Casa Gangotena is the ideal place to begin your walk to encounter the best activities to do in Quito and start exploring thousands of years of history. 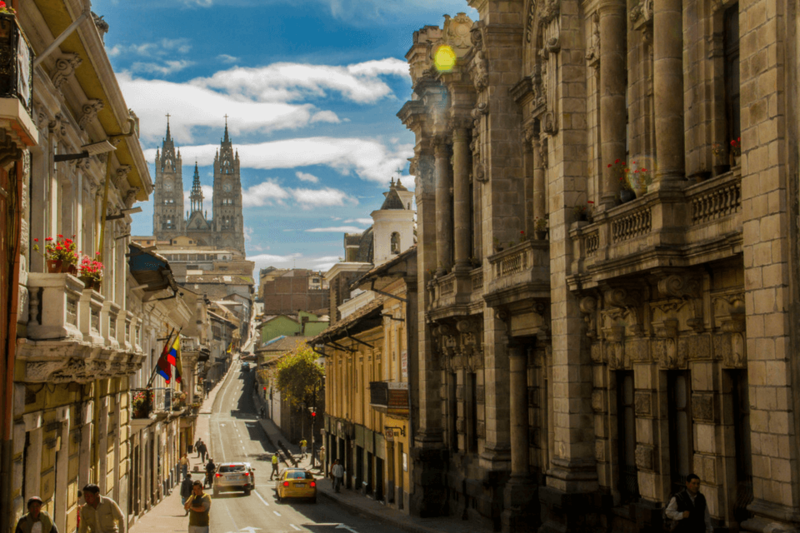 Before venturing through the city, make sure to visit Calle Cuenca, an iconic street that best represents traditional Quiteño life. As soon as you step out beyond Casa Gangotena’s garden, you’ll begin perceiving an aroma of herbs and you’ll see colorful piñatas decorating the street. It’s impossible to ignore the scents emanating from the spice store facing Casa Gangotena. With spice-filled jars and wooden boxes brimming with delicacies, you won’t be able to avoid stepping in every time you leave the hotel. Only a few meters from the hotel entrance you’ll find the Museum Casa del Alabado, which hosts an impressive collection of pre-Colombian pieces representing various Ecuadorian ethnic groups. Originally a Colonial house, the museum was built in 1611 and has been beautifully restored. It includes a patio where you can order a cappuccino and a delightful treat: chocolates made from figs that were harvested from the very trees that adorn the patio in the upper part of the museum. Exit towards Calle Rocafuerte and you’ll come to the Santa Clara Plaza, where you can visit the monastery and church. Keep walking downhill along the street to reach the Museo de la Ciudad’s ancient walls. Instead of exhibiting archaeological pieces or works of art from a number of different time periods, the Museo de la Ciudad reveals the story and everyday Quiteño life from its aboriginal origins until the 19th century. 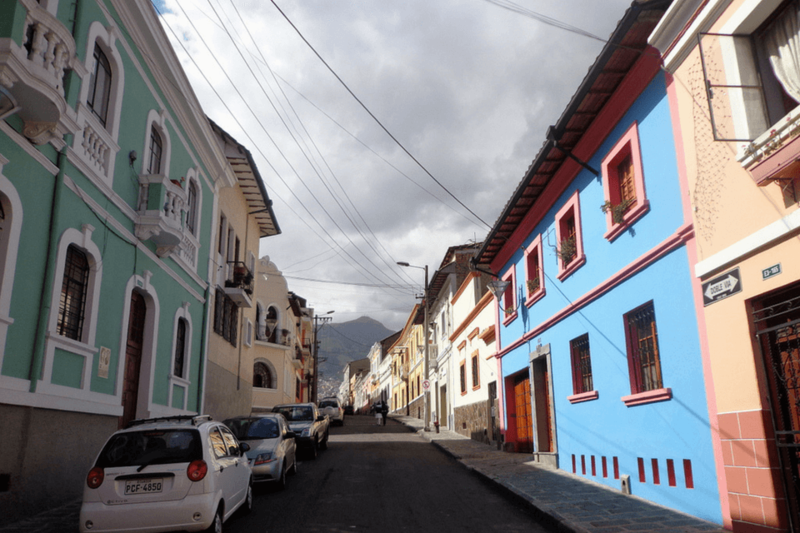 If you want to travel back to Quito in the 1800’s, one of the best activities to do in Quito is to walk down La Ronda. This bohemian neighborhood winds its way along a pretty street lined with geraniums and colorful flags that hang from old, ornate balconies. Along the street, you’ll find an array of stores that display the essence of Quito culture, such as the Zabalartes toy store, where you can find spinning tops, yo-yos and wooden dolls. Enjoy a delicious plate of typical Ecuadorian food and warm canelazos in the bars that resonate with live music every night. Don’t miss visiting the República del Cacao and Chez Tiff stores to buy chocolate made from Ecuadorian cacao, the finest in the world. As you leave la Ronda, via Calle Guayaquil, keep walking toward Plaza Santo Domingo, and continue left toward Calle Flores, where you’ll find a series of stores specialized in candle making. Since you’re already here, buy a set of hanging candles in the shape of a bouquet of flowers, available in a variety of colors. When you reach the corner café, Dios No Muere, turn right on Calle Junín. Walk along a huge white wall belonging to the Santa Catalina Monastery, one of the five oldest female cloistered convents in the city. Before reaching Plaza San Marcos, you’ll come across many places to dine, such as Café Khipus (they make tequila and piña colada flavored chocolates) and the “hipster” bar, Sirka, which showcases murals and paintings by local artists. Exiting Hotel Casa Gangotena, you’ll find yourself before Plaza San Francisco, with a background of the majestic Pichincha and the massive stone bell towers of the oldest church in Ecuador. Under the arches of San Francisco’s atrium you find Tianguez, a terrace café overlooking the domes of the surrounding churches. Tianguez means “market” in the ancient dialects of Quito and, as its name indicates, the café also contains a museum of handicrafts. In the tunnels built under the church of San Francisco, you can find all kinds of crafts, such as jewelry made out of tagua seed, detailed ceramics and colorful animal masks. As you walk downhill on Calle Sucre, you arrive at the Numismatic Museum, the former building occupied by the Central Bank of Ecuador. The museum recounts the story and evolution of Ecuador’s currency, the sucre, including periods in pre-Hispanic aboriginal societies, its impact on the colonial period and the issuance of banknotes until dollarization. On the opposite side of Calle Sucre, you reach the imposing façade of the Church of the Company of Jesus (Compañía de Jesús), made of Andean volcanic stone. Every surface of its interior is bathed in gold leaf and decorated with paintings by artists from the Quito School of Art and beyond. The church is considered the most beautiful in the country. 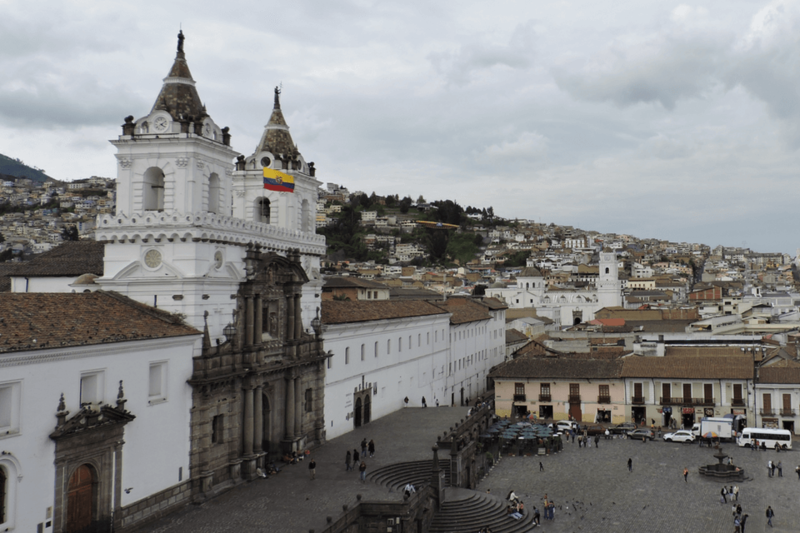 Among the activities in Quito that you shouldn’t miss is climbing to the top of its dome. August 10, 1809. On the periphery of the plaza you’ll see a series of historic buildings. To the North is the Archbishop’s Palace, where you can have lunch in one of the cozy restaurants. The Cathedral of Quito, one of the oldest churches on the continent, is located on the south side of the plaza. You can also admire the Government Palace, a white building crowned with a huge Ecuadorian flag. If you happen to be here on Monday at 11 am, you will catch the change of guards, a popular activity in Quito. Continue north along Calle Venezuela, where you’ll spot the silhouette of the Basilica’s gothic towers in the distance on the hill. A few steps away lies the Carmen Bajo Monastery. Be sure to admire its marvelous front door, carved by one of the few female artists of Quito’s Colonial period: Mother María Magdalena Dávalos. Up ahead, you come to colonial façade belonging to the house of the Camilo Egas Museum. Here, you can enjoy the works and legacy of Ecuador’s forerunner of modern and contemporary art. Continue along this street until you are at the foot of the Basilica, the largest neo-Gothic church in Latin America. 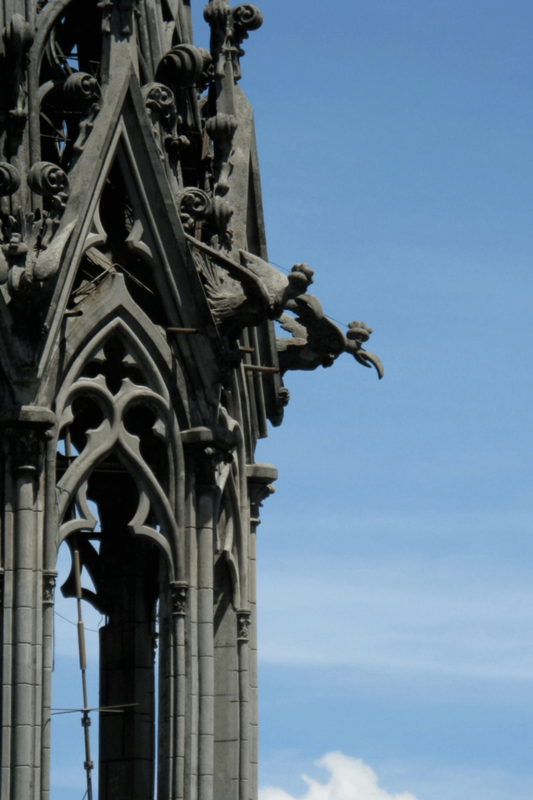 What sets it apart from other churches of this style is that, instead of traditional gargoyles, this Basilica is decorated with turtles, iguanas and other creatures endemic to Ecuador. Inside, its gray walls are illuminated by the sun’s rays that shine through the stained-glass windows. The legends that surround the Basilica add intrigue and mystery to its history. The church isn’t yet finished, and there are many who believe that when the building is finally completed, the world will end. Many locals also believe that the heart of ex-president García Moreno lies within the corridors of the Basilica’s adjoining convent. 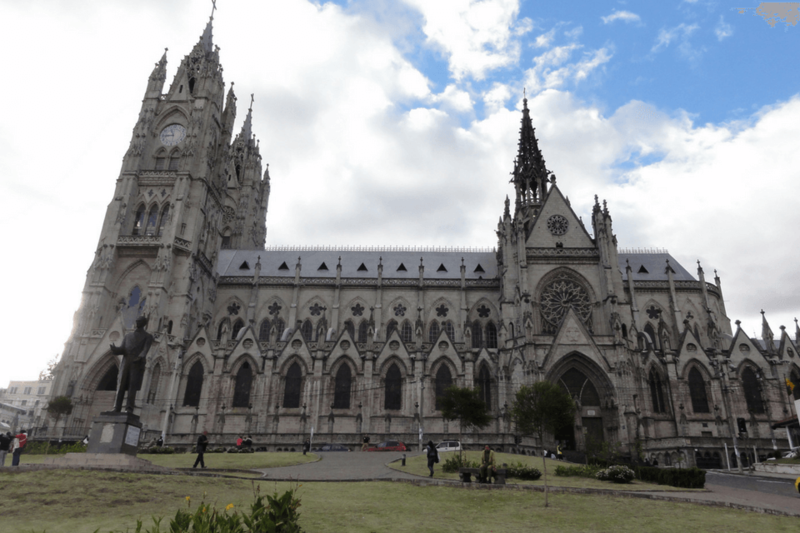 If you like adrenaline-filled adventure, the Basilica is the perfect place for one of the best activities to do in Quito. For the brave among you, make your way up the church’s northern towers. You’ll first have to navigate across a small wooden bridge before climbing steep metal steps to reach a platform on the tower where you can enjoy a 360 degree view of the Ecuadorian capital from a height of 79 meters (260 feet). Ecuador boasts an abundance of brilliant colors and exotic flavors. One activity you can’t miss is exploring a locals’ market; truly one of the more fascinating activities you can do in Quito. “Panama” hats for more than five generations. When you arrive at the intersection with García Moreno, turn left until you reach the Independence Square (Plaza de la Independencia), which is a shining example of the social and cultural pulse of the Andean capital. If you are impressed with how beautiful everything looks from below, you can’t leave without first venturing up to the ceramic domes of the Cathedral; the Old Town is best viewed from the domes of its churches and convents. Also, it’s fun! Dare to venture into the darkness of the church’s secret passages, where the stone stairs are very narrow and the corridors can be uncomfortable to navigate. It’s worth it. Once on top, you will be rewarded with an amazing view, where you can observe how colonial architecture and Andean nature merge. Follow Calle Chile downhill from the Archbishop’s Palace, and turn left onto Calle Guayaquil. Enter through Heladería San Agustín’s wooden doors, the same doors that you would have entered back in 1858. You will be greeted by the delicious smell of homemade food, prepared with ancestral recipes that continue to delight palates of both locals and visitors down the years. The atmosphere is quite unique: old radios and telephones are scattered around the red-walled premises, adorned with newspaper clippings that tell the Parlor’s story, as well as gold-framed mirrors. One glance toward the fresh humitas, giant empanadas and figs, and you won’t be able to resist the temptation to taste a little bit of everything. It is, however, the artisanal ice creams that gives San Agustín its name. The ice cream is completely handmade and all ingredients are directly sourced, from the harvest of the fruit to the ice collected from the mountains. Following these traditional delicacies, go down Calle Mejía to reach Plaza Huerto San Agustín, an oasis of modern architecture in the middle of a Colonial world. The square, renovated in 2016, incorporates manicured green areas and pools of water with black, volcanic stone floors. Around these pools you’ll find several wooden lizards representing an old legend about the square. It is said that, despite locals’ claims that there were thousands of lizards under the land of San Agustin, the owner refused to sell it. However, when a lizard appeared in his bed, he didn’t hesitate another moment to sell the land. Finish your tour by walking down Calle Flores and then Olmedo Street. Once you reach Pichincha Avenue, go straight and cross underneath to reach the Central Market, one of the most visited markets in Quito since 1950. If you enjoy tasting exquisite and exotic food, a visit to the Central Market is an activity in Quito that is not to be missed. There is no better way to discover the delights that define Ecuadorian cuisine than to explore the market and the plates served at the dozens of tables, brimming with traditionally prepared dishes. You can find all kinds of food, from llapingachos (stuffed potato patties), hornado (slow roasted pork) and a variety of ceviches. Also, the fruit stands are impossible to ignore. 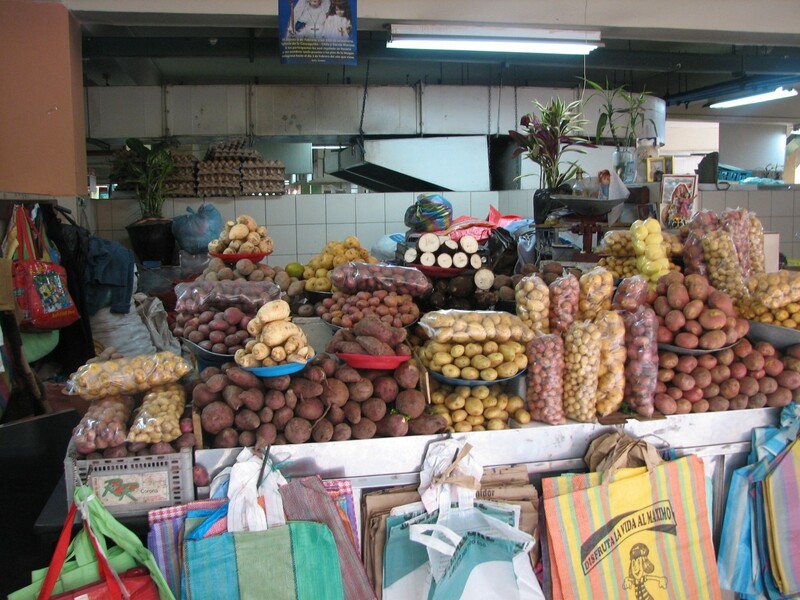 Each one is a mosaic of colors and textures, with endemic fruits decorating the tables and the market’s cement floor. 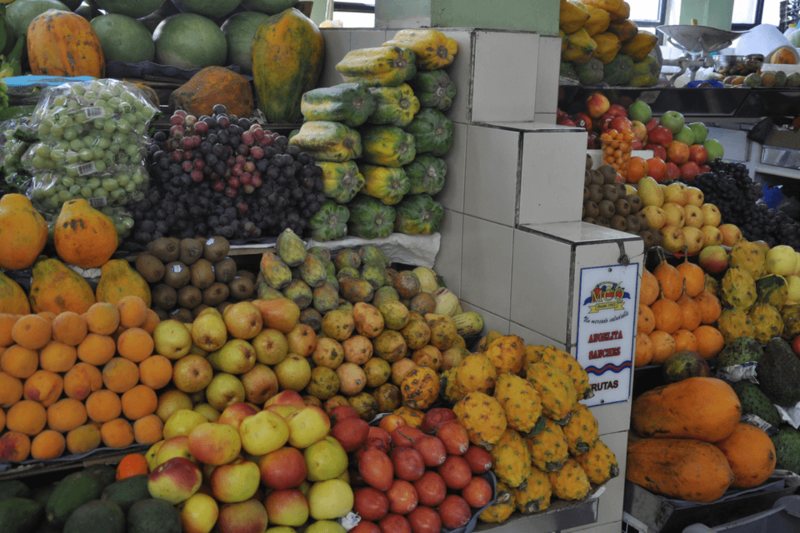 Thanks to Ecuador diverse climates, all kinds of fruit are grown here, from watermelon and pineapple to the more exotic naranjilla, taxo, and salaak, an Amazonian fruit known as “snake skin”. 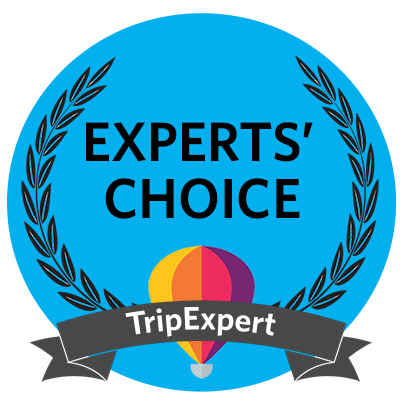 Here, Ecuadorians and tourists alike can explore decades of culinary tradition amidst brilliant colors and flavors.